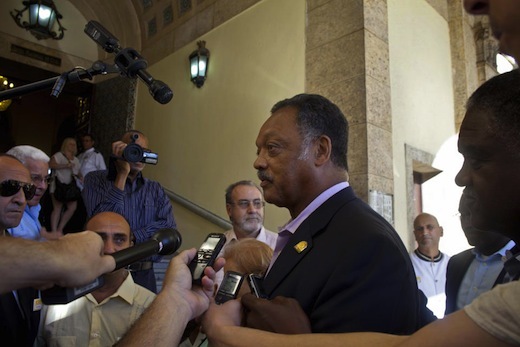 Civil rights advocate Jesse Jackson, attending a religious ceremony organized by the Cuban Council of Churches at the Havana-based Ebenezer Baptist Church in Cuba, called for actions against the economic blockade maintained against Cuba by the U.S. government, which has been in effect for more than 50 years now. 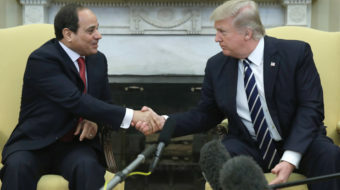 He said the blockade affects the lives of the Cuban people and hinders relations between the two nations, stressing the need to strengthen relations between the U.S. and Cuban people. The blockade effects the use of the Internet on the island, telephone calls and transportation. It also restricts individual American’s freedom to travel to Cuba as well as hindering communication with the island. 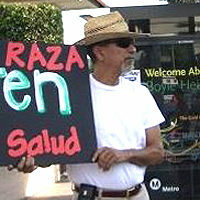 Participants recalled previous visits by the civil rights activist to Cuba in 1984 and 1988. The Reverend Jackson recalled his meetings with Cuban revolutionary leader and former President Fidel Castro. On Friday night, Jackson spoke in Havana and met with Colombian rebel commanders of the Armed Forces of the Colombian Revolution (FARC) who are in Cuba, a neutral ground, for peace talks with the Colombian government. On Saturday Jackson accepted a request by the FARC delegation to oversee the release of a former U.S. Marine being held by the FARC and which Jackson had called for 10 days earlier while on a visit to Colombia. “We accept this obligation and opportunity to render service to Kevin Scott, his family and our nation,” Jackson said. “We have made contact with the State Department urging them to contact as quickly as possible the nearest of kin of Kevin Scott because his release is imminent.” Jackson said he hoped to arrive in Colombia within a week to facilitate the release. On Monday, Jackson ended his four day visit to Cuba without seeing jailed U.S. government development Alan Gross who is serving a 15-year sentence in the Caribbean nation. Island authorities told Reverend Jackson the visit could not be arranged in time. Alan Gross was arrested in 2009 while importing restricted communications equipment as part of a U.S. government-funded “democracy building program” which the Cubans say is part of US attempts to destabilize their country. Gross was accused of spying and convicted under a statute governing crimes against the Cuban state.